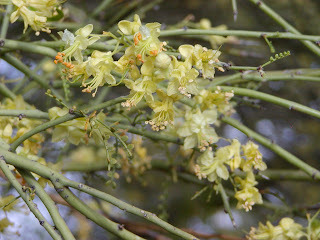 The ironwood trees are in blossom. From a distance, they look like pale pink trees. It is only up close that you can distinguish the blooms. 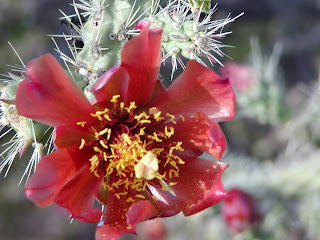 This is such a lovely flower for such a nasty cactus! 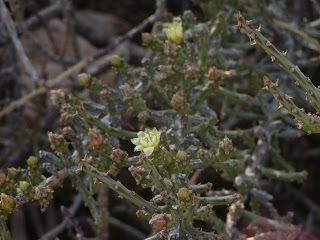 The chollas are hooked and can cause a lot of pain. 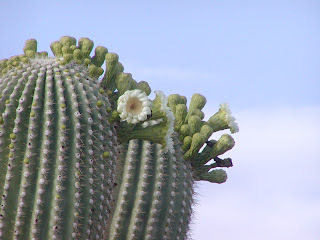 The saguaros are also blooming. Hard to believe that their fruit is so red inside. The Christmas cactus is also in bloom.They have the tiniest little needles on them, that are just as bad to remove as the barbs of the cholla. 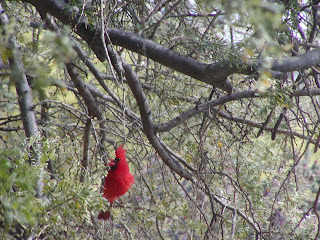 We know summer is here, when the cardinals show up. We have had a pair nest in the ironwood tree outside my studio window every year that we have been here. I took this picture from inside. I think it turned out better than the ones I took outside, where I was actually closer to him. 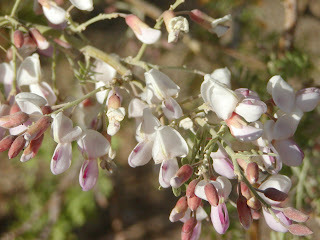 These are the blossoms on the palo verde trees. We have both types. The ground is now covered in yellow - except where the goats and sheep are - it is either in their hair or eaten by them. The goats love chewing on the branches of the palo verdes that we prune. I try not to give them the branches from the blue ones, because they have stickers and it is murder to get them out of the kid mohair. I noticed that I don't have any barrel cactus flowers. Will have to try to find one tomorrow. Anyhow, I am going to try to reproduce their colors in yarn. Marc is in New Jersey and cold - he says it was 40-50 degrees and raining yesterday. Kyle just came and told me that it is going to drop to 70 by Friday and possibly rain. The break in the heat will be nice. I had the fans running yesterday and I was hosing off the alpacas and a few of the heavy fleeced goats. They loved the wind today. It drove me nuts! If you ever don't find me in the studio or shop, call the home number. Now that it has gotten hot and less people are coming out, I am in production mode and running into the house regularly to wash fleeces. Just call the home number listed on the sign at the door, or browse till I come back.